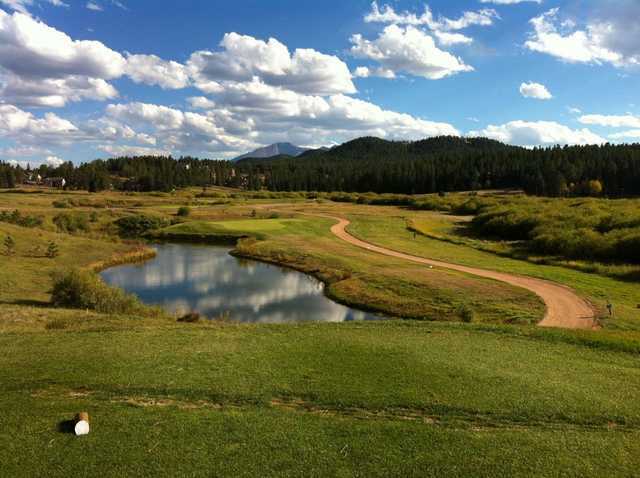 The 18-hole Shining Mountain Golf Club in Woodland Park, CO is a semi-private golf course that opened in 1995. 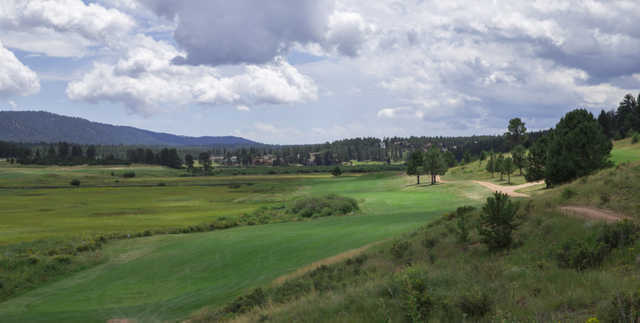 Designed by John Harbottle III, Shining Mountain Golf Club measures 6478 yards from the longest tees and has a slope rating of 135 and a 70.4 USGA rating. The course features 4 sets of tees for different skill levels. Dress code: Proper golf attire required. Collared shirts or mock turtlenecks. No T-shirts, cut-off jeans (or ragged jeans), halter tops or tank tops allowed. Arrived for mid-morning Tee time and went out on time. My friend and I were from out of State and looked forward to playing this course. Views were great. Arrived at 3rd tee box to find 6 players who refused to let our twosome play through claiming golf tourney was in process and several holes were filled ahead and they would not allow us through. .Facing a 6-7 hour round we left and requested money back. Never played a course where Tee times followed a large tourney. Normally course is closed for tourney while it is in play. Really wanted to play course as scenery was great. Long trip for this result. Two stars for views. Call ahead and ask if tourney is in place before going here. 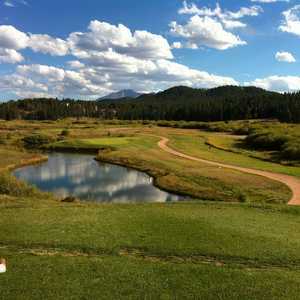 Outstanding mountain golf experience. Played it in early May and the greens were in bad shape due to winter kill but played it last week and the greens were great. Definitely a target golf course or you're going to lose lots of balls. Customer service was extremely friendly and helpful. Must play especially for the price. We played your course Sunday. We found it very unappealing except for the views. Their were millions of mosquitous because of all the water standing around. The greens were nothing but sand and I might add, there were three young boys driving the cart all over the course. With one of the boys jumping up and down on the back of the cart. They cut in front of us while we were on the 4th, par 3, hole. I stopped them and ask if they worked for the golf course and they said they did. I told them they were rude and needed some guidance from an adult. They were polite and I hope they took the correction seriously. We will not be back to Shinning Mountain course until all of these issues are corrected. I would give 2 stars if it were not for the price!!!! Have heard the place advertised and decided to check-it out so played it with my son a few weeks ago. We live in Colorado springs and made the drive up. The pro shop service w (check-in) was good and the gentleman was very friendly and helpful. They should not list that they have a driving range. It is an unmowed, unmarked hill "behind" the building. There is enough room for about 8-10 players to hit balls and you can't hit Driver because of the proximity to the road at the top of the hill. The chipping green was completely dead and not of much use other than it had a flag that you could use for a target. The fairways were rock hard and we had a couple of bounces that were higher than our heads. The greens were also pretty hard (which is hard to understand given the amount of rain and snow we have encountered in the area this year). The grass on the greens was so thin that you could see dirt and the punch marlks from aeration in many places on them and they had a lot of dead areas on them as well. This is an outstanding golf course from many different perspectives. To beging with, the views are incomparable. 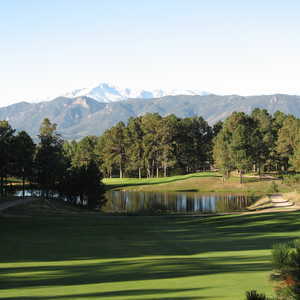 With Pikes Peak as a backdrop and expansive views of meadows and forested lands, it is a very beautiful setting. 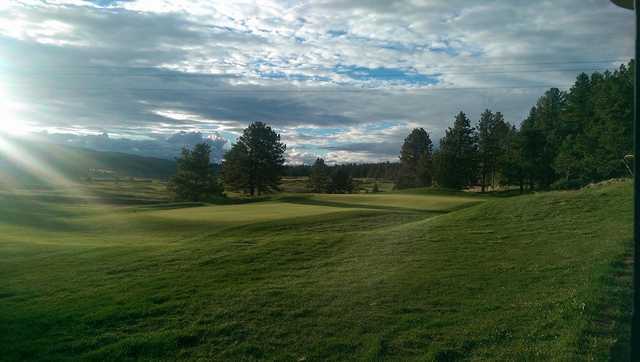 The golf course is challenging, but if you aren't too greedy, you can score well here. 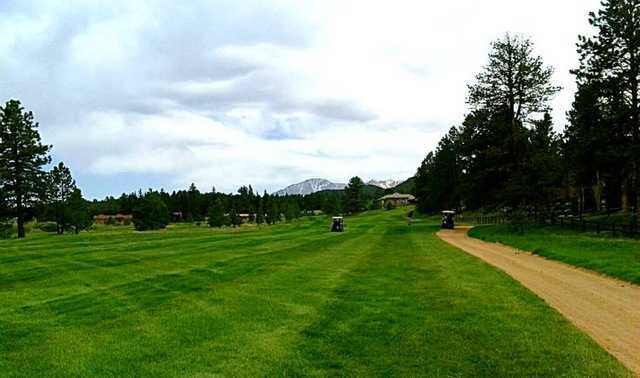 Most of the fairways are narrow and you will score better if you can stay on the fairway. The greens are great. Not too fast and not too much slope; you won't drive yourself crazy trying to sink that 3' putt. 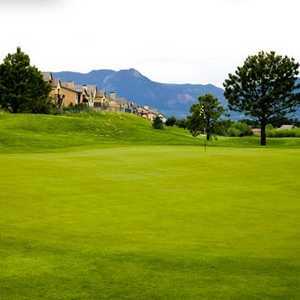 The golf course is well maintained, bunkers are raked, greens and fairways are well manicured. The staff is friendly and helpful. They are always ready to take care of your concerns. I highly recommend this golf experience. This golf course was the high point of my vacation! Beautiful course but very challenging! Be wary of #15, that hole is brutal! The staff was incredibly courteous and helpful, but more importantly, friendly. The two men in the pro shop were funny and it really seemed like they care about their course. The food was some of the best I've had. I had their burger with spicy pepperjack cheese and their cilantro coleslaw and it was perfect! If you haven't played this course, you really should because I know that I will definitely be returning! Course is in great playing condition. The restaurant and pro shop are lacking in customer service. The staff are rude and inconsiderate. The restaurant is dirty and the course needs to maintain its tee boxes better. I do not recommend playing this course. "Do you have enough golf balls to play this course?" This is posted in the club house, but the course requires accuracy to shoot low on this tight course. I have played it multiple times and always found the course in great shape. Outstanding views! I've played golf a long time and all around the world and I have to say that this course is very nice. It's average length but tight. If you're off the fairway, you have a real problem. Pace of play is usually pretty good and tee times are usually available - especially on the weekdays. The fairways are great and the greens are above average. If you're in the area, make the time to play this one..........bring some extra balls though.